Thank you to everyone who spoke up to oppose Bill 24 – the proposed Agricultural Land Commission Amendment Act, 2014. Your voices played an important role in slowing the progress of this bill and in convincing the government that changes to the Bill were necessary. So we have momentum. But unfortunately the government’s changes do not change the fact that the bill undermines legal protection for farmland. . We continue to press the government to shelve Bill 24 and to undertake some real consultation on how agricultural land should be managed in BC. What do the new amendments do? On a quick read, the addition of “in descending order of priority” sounds like a major improvement – now the purposes of the commission (the protection of agriculture) must be given greater weight than the other considerations. But in reality, this new language provides very little real direction on how to balance agricultural and economic, social and cultural values or planning objectives. Indeed, since the Bill actually requires the Agricultural Land Commission (ALC) to consider economic and other values, the ALC will need to accept evidence and figure out how to balance the fact that a development might bring in x millions of dollars should be considered against the value of class y farmland for agriculture. The fact that the protection of agriculture should be given priority doesn’t really provide much guidance about how to balance these interests. If the purposes of the Bill were, as Minister Letnick insists, to provide flexibility for farmers seeking to remain on the farm, the amendments would focus on the economic, cultural and social values of farmers – not on ill-defined, but broad economic, cultural and social values of society. The vagueness of these provisions invite arguments that lands should be freed up for development or industrial uses, undermining the protection offered by the Act. “Community Need” all over again? The Agricultural Land Commission panels that consider applications are approving removals at a high rate. In the four years ending in March 2005, the Commission statistics show it approved the removal of 71.4 per cent of the reserve’s 7,493 hectares under consideration. Land removal rates in the ALC’s six regions were highest on Vancouver Island at 86.8 percent, in the Kootenay region at 84.5 per cent, and in the Okanagan at 81 per cent. On the south coast, 55.5 per cent of land was released, in the Interior the total was 52.6 per cent, and in the north it was 46.8 per cent. This “social need criteria” was not supported by the Agricultural Land Commission Act, and in 2007 SmartGrowth BC, with a grant from our Environmental Dispute Resolution Fund, commissioned a legal opinion questioning the legality of these decisions. The Commission shortly thereafter stopped accepting “community need” applications, and removal of agricultural land from the ALR decreased considerably. The Commission also reduced the use of regional panels, which were being too influenced by local economic and social values, and less interested in ensuring provincial-level goals for agricultural protection. Without the courage to hold firm, with stakes in the ground, there will be no incentive to better manage our land base in the face of competing uses. We must halt the slow, but steady erosion of our agriculture and food resources, and support our varied agricultural industries. As a forward thinking society, we must dig in, take responsibility, and make sure that future generations have a vibrant agricultural land base. Tell the BC government that you stand for food security and against Bill 24. 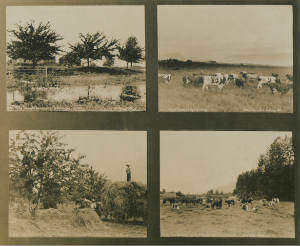 Photo R. Broadridge, "British Columbia Farm Scenes", copyright 1912, obtained from Wikimedia Commons. * - The changes would allow the ALC's Executive Director, subject to regulation, to decide that an application is of provincial significance, and should be considered by the ALC Executive, rather than a regional panel. While an improvement, it is important to note that most of the individual "community need" applications did not, by themselves, have provincial significance. It was these many small applications collectively that began to whittle away at the agricultural lands protected in certain regions of the province.